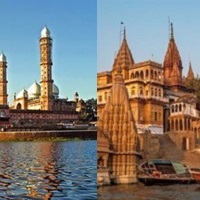 I was born at Varanasi, situated on the banks of the holy Ganga, although in all practical sense I have been a Bhopali, for I was brought up here, in the capital city of India’s erstwhile largest state - Madhya Pradesh. I did my schooling from Raman Higher Secondary School, part of the education society schools of Public sector giant BHEL and named after the renowned Indian Nobel laureate. 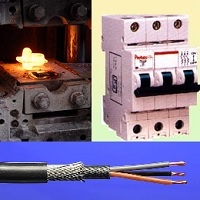 I attained my Bachelors in Electrical engineering from Awadhesh Pratap Singh University, Rewa (land of the white tigers). Apart from this, I have been attained PG diplomas in Operations and Marketing Management (from IGNOU, Delhi) and PG Diploma in Advanced Computing (from CDAC). 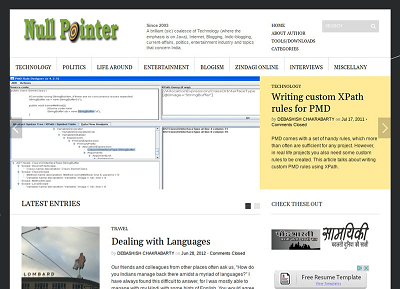 I am a Software Consultant based at Pune (and an erstwhile blogger and podcaster). Have been on the Internet since the Yahoo Geocities days; opened my Blogger account in October 2002. 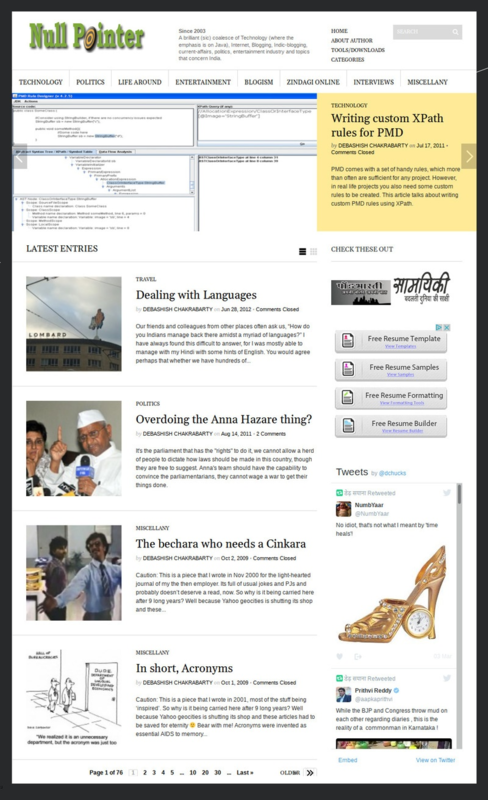 On Geocities I hosted couple of sites including an [Amitabh Bachchan fan site](, a site for Java lovers called Wah Java!. I have English blog Null Pointer and a Hindi one NuktaChini, though most of his blogging has now been replaced by micro-blogging at Twitter. Views my own or authors’, not of my employer. 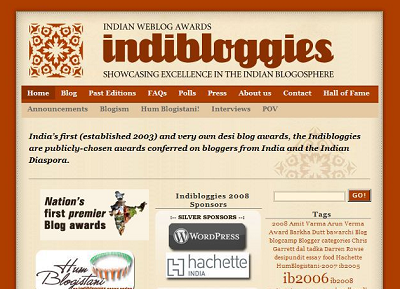 Indibloggies was an annual blog-award clique for Indian Blogs. The site “showcased the best of the Indian blogosphere” and awarded English as well as Indic blogs authored by Indians and the Indian Diaspora. 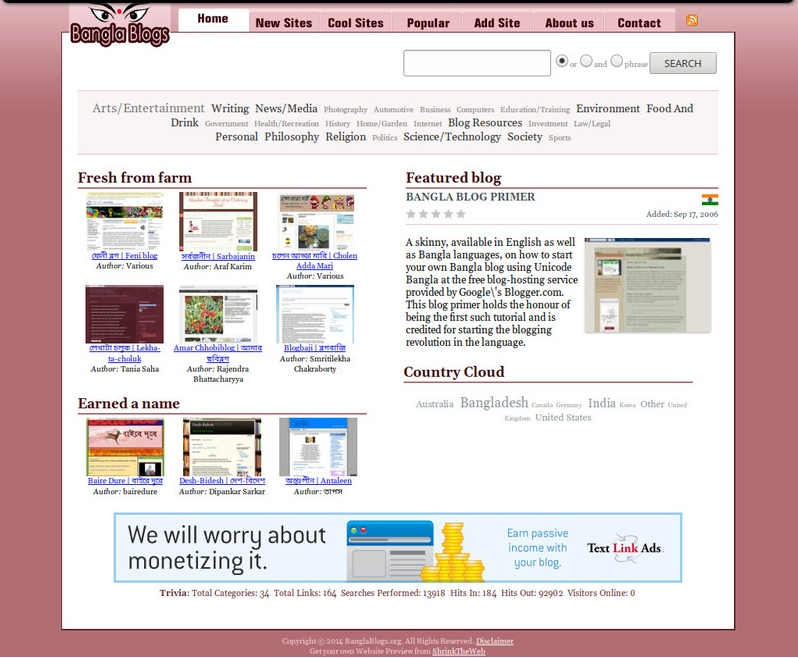 Indibloggies hosted 5 editions between 2003-2008 and became quite popular and is still regarded as prestigious by the winners. Though the modus-operandi had been different each year, the Indibloggies decided the winners in various award categories based on a mix of peer-review from a panel of jurors, public nominations and public voting. From 2005 onward Indibloggies used the social book marking site Del.icio.us to solicit category-wide public nominations. 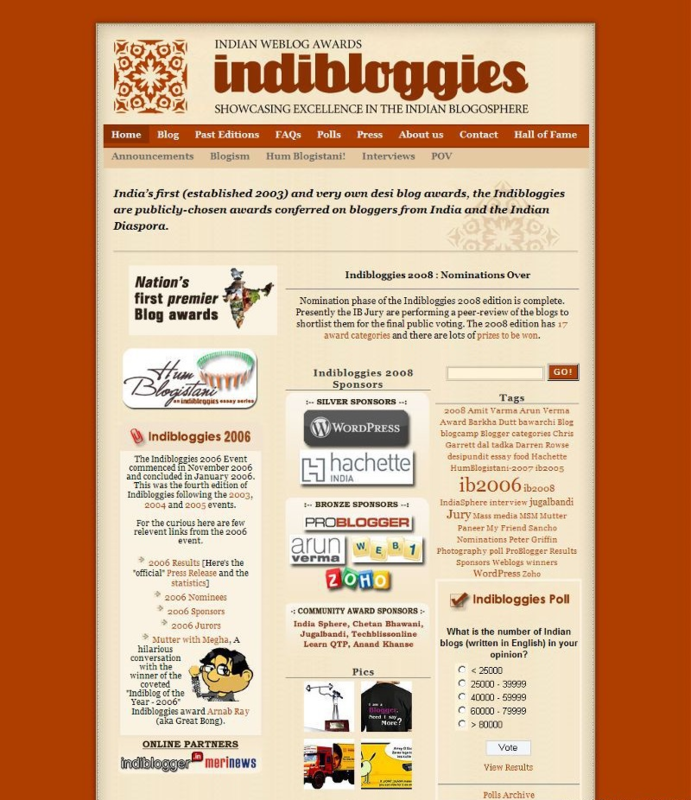 Indibloggies website theme and logo were designed by the talented Bangalore based designer Hussain. Indibloggies could be credited for recognizing some outstanding bloggers year after year. For example, Sonia Faleiro, who’s blog was adjudged the “Best Topical Blog” in 2006 went on to win the CNN Young Journalist award the same year; Amit Varma, author of “India Uncut”, won the “Best New Indiblog” award in 2005 and then went on to win the Bastiat Prize in 2007 and later landed a book deal with Hachette India. Similarly, Arnab Ray, a consecutive winner of “Best Indiblog” later landed a book deal with Harpercollins that was a best-seller. Over the years Indibloggies also ran an essay series called Hum Blogistani that featured essays written by well known contemporary bloggers from the subcontinent, these are available as a free ebook. This publication is a collection of 10 essays published between 2005 to 2007 and provide a bird’s eye view of the state of the Indian blogosphere during that period. 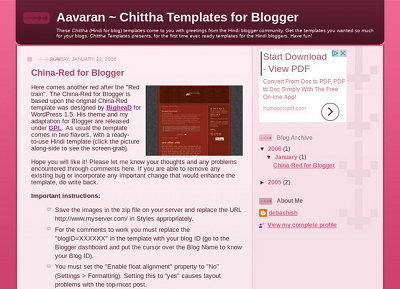 I created Aavaran in 2005 on the Blogspot blogs to enable Hindi bloggers get new ready-to-use Hindi Blogger templates (blogger didn’t support i18n in those days). 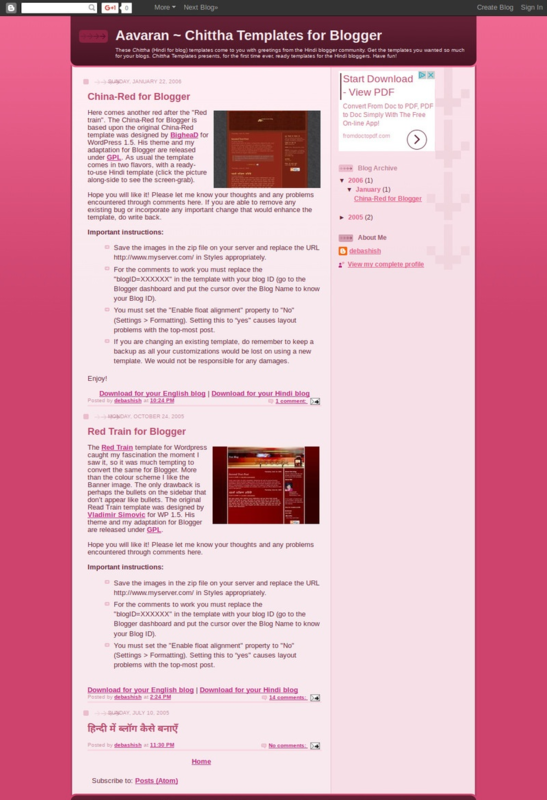 The idea was also to adapt popular themes of other blogwares like WordPress to Blogger platform. I started with two of the templates I fancied, Read Train and China Red. Podbharti, claimed to be India’s first pure Hindi Podzine targeted towards Hindi audience was launched & co-hosted by me with a blogger friend from Mumbai Shashi Singh in 2009 with the intention to provide a comprehensive coverage of News & Views about Indian language blogging, Tools & Technology, Current Affairs and the Entertainment Industry. The Podcast (or Podzine, as we called it, given that each episode had multiple stories) was much appreciated and I still feel sad that we didn’t continue it for long. 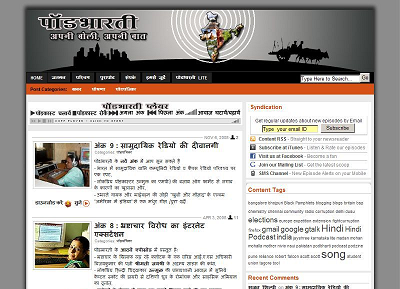 Podbharti published 9 episodes with over 25 reports. It was hosted at Podbharti.com and the archives now live at Wordpress. The audio files were hosted at Blip.tv earlier, then on Podbazaar.com and now live on SoundCloud. Podbharti also got nominated for the TATA NEN Hottest startup awards in 2008. 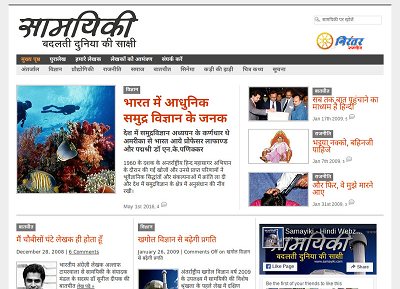 Pranav of StartupDunia also published an interview with me regarding the website. 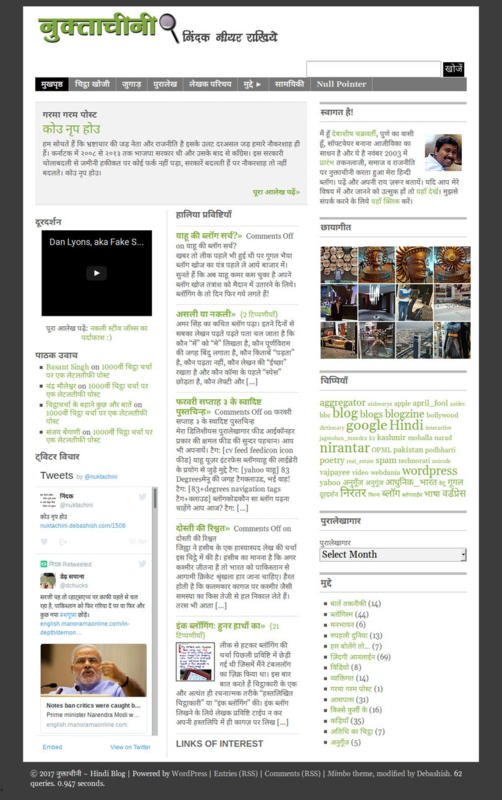 I was drawn to Hindi blogging during my work stint at Webdunia.com, a leading organization in the are of Indic localization. 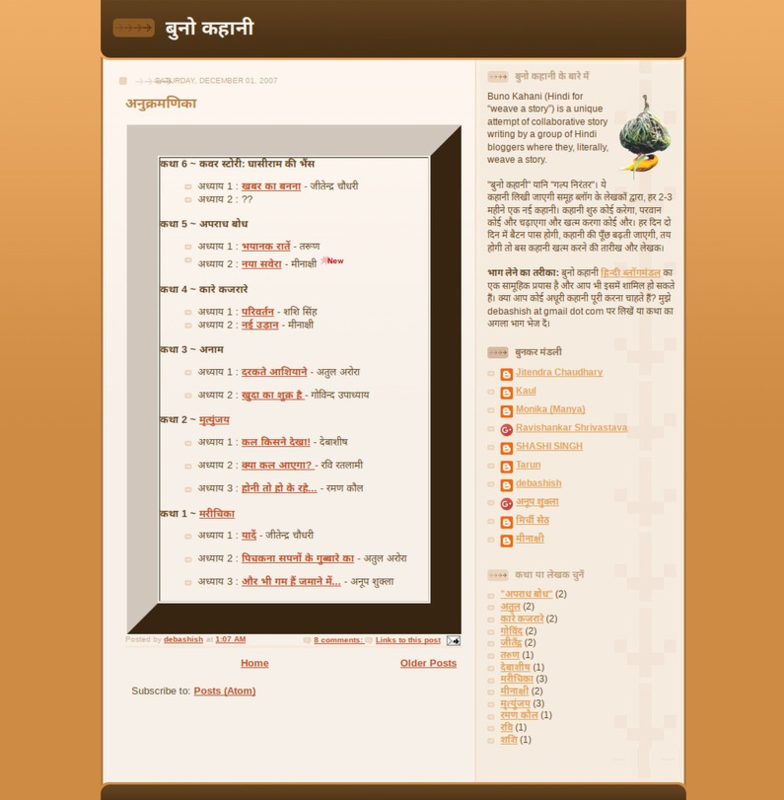 At the time there were only two Hindi blogs around, Vinay Jain’s Hindi and Alok’s Nau do gyarah. Alok is also credited for coining the term Chittha for Hindi blogs. So officially Nuktachini is the 4th Hindi blog ever published (the third blog belonged to a friend d.Padmaja](9211.blogspot.in) and was also created by me. The blog was noticed right from the early days, here a mention in the Hindi magazine Kadambini, and enjoyed good readership. Debashish’s modest comments do not reveal him and his work. 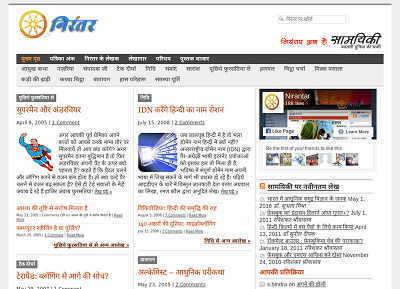 Actually he is one of the pioneers in Hindi blogging. Blogging in Eastern languages has not been easy, but the boost came when a couple of visionaries decided to do something in Hindi. Debashish was one of them. 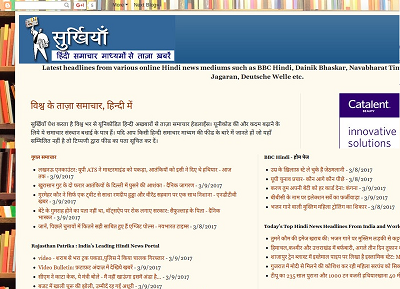 The blog featured here is Nuktachini and it is a popular Hindi word for criticism. This does not mean that the blog is full of gossip. On the contrary, it is loaded with useful articles and you would soon feel that the name ought to have been something different. 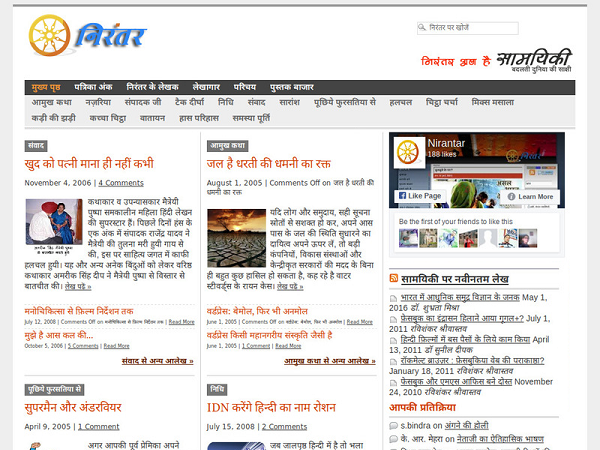 Debashish is leading the push towards Hindi blogs. 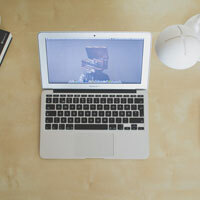 I think blogging in th’vernacular is a great idea as it exposes a totally different audience to very different ideas. 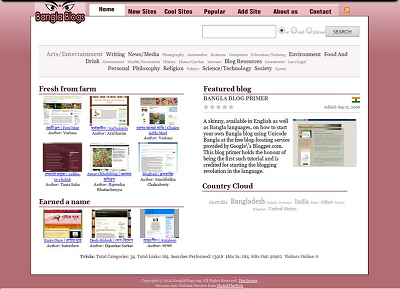 Bangla Blog was a test blog that I created with a fellow blogger Sukanya Majumdar (who not incidentally, is the first ever Bangla blogger as well) to demonstrate how Bangla Unicode could be used to publish Bangla blogs on the Blogspot platform. Buno Kahani (Hindi for “weave a story”) was a unique attempt of collaborative story writing by a group of Hindi bloggers where they, literally, weave a story. About 6 stories were written this way, each written by different authors who take the story forward.